By now most of you guys have seen the news and all that went down in the south here. 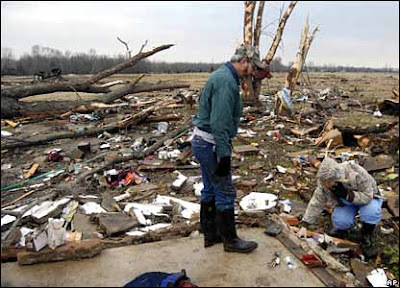 A big storm just swept through with tornadoes that killed over 52 people and injured well over 100 people. 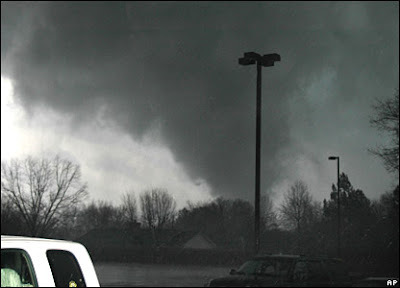 One of my biggest fears is tornadoes!!!!! I hate them!!!!!!!!! I feel sorry for all that have lost their loved ones, their homes, everything and to those who have been injured.... My prayers are with them. I woke up at 10 till 7 this morning and it was really calm and there was lightening. I didn't know that there were tornado watches or anything, because I would of been freaking out! The weather was unusually hot tuesday and was like 73. John was saying there's bound to be a storm coming. Well I went to take Gidget to potty and it was pouring and the wind was going crazy! Gidget stepped on the porch and then ran in the house lol! There was no way she was going to get wet lol! Finally it died down so I could get her to go out and then leave. Well I get in the car and I hear Tornado warnings for Hamilton and Bradley counties. I almost just went right back in the house. I was like no!! I ain't going lol! When I get to work Jill tells me that when she was leaving that the radio had said do not go on 24 or go downtown there is a tornado warning. ha too late! She called Audrey who is already at work and Audrey was like there's nothing going on here. Well right after Audrey hung up they made them get in the stairwells lol! I just missed all the action thank goodness. lol! Everywhere I went there were floods I didn't think I was ever going to get to work. I did make it and drove through flood water to get there (stupid I might add yet nothing happened.). I was only 2 minutes late! lol! Beat that! But over all a crazy day!